This article aims to supplement the “Going live instructions by registrar” guide on the HubSpot’s Academy Knowledge base. This guide will also give you some insight on how this can look on a domain name registrar’s portal. In this case, Hover.com. In most cases, you would be looking to create subdomains to connect with HubSpot. Subdomains are a subdivision of a domain and are essentially extensions of your current domain. We create subdomains as it allows us to create website domains that will be independent from your main website (which typically is www.yourcompany.com). Common subdomains that you often see are blog.yourcompany.com. For example, Google uses this for their website. You can see more on how subdomains are connected in a diagram here. So how you create a subdomain is first thinking about how you’d like to define what you’d like as your subdomain name. There is no right or wrong answer to this, as it completely depends on what you’d like to use as a business to name it. The main consideration is that you should often consider names that is most relevant to the subdomain’s purpose. So for Google, “news” is their main purpose, so they defined their subdomain so that it is “news.google.com”. Note – you will need to host your website on HubSpot to use your websites as your domain. This is a paid add on. Once you know what subdomain name alias you’d like to use. Then you’d want to set this up and define them on HubSpot. Later, you’ll also need to define it in your DNS (Domain name system) manager on your domain name registrar. How do I connect my domains in HubSpot? You’ll need to go into the “Domain Manager”, and this is where you will set this up. To go to your “Domain Manager”. Click on Content > Content Settings > Domain Manager. That is, Content Settings from the Content” menu (the last option on the screenshot below). Then click on “Domain Manager” from the second group of menus under the grey header “Content Optimisation Systems Tools”. 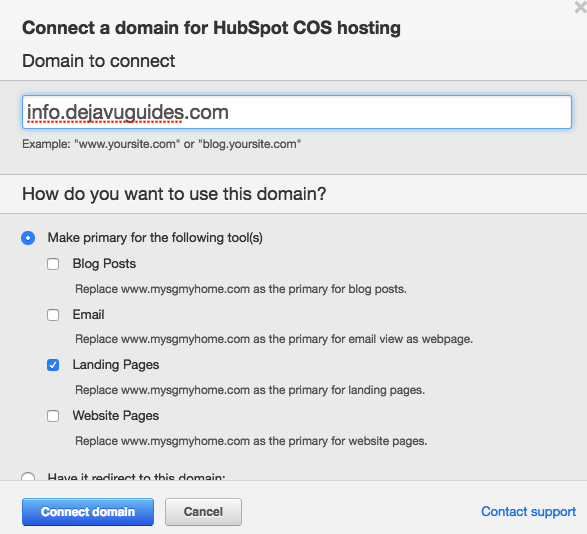 Type in the subdomain you want to configure on HubSpot, then click “Connect domain” when you’re ready. In my example, I have created “info.dejavuguides.com”. You will notice that I have marked the part of HubSpot that I want associated with “Landing Pages”. You can also choose to associate your “Blog”, “Email”, and “Website Pages”* with the same subdomain. Copy this CNAME address. You’ll need this to configure some settings on your domain name registrar. 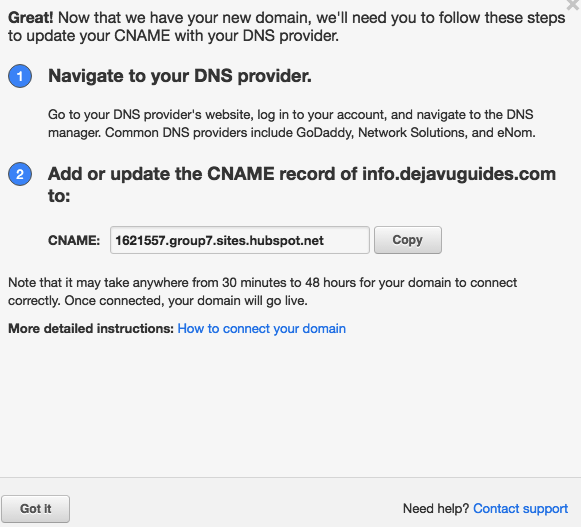 We need to add in a CNAME record into your domain name registrar. You may need to ask your webmaster or IT administrator if you don’t have access to this. My domain name registrar is Hover.com. So I will show you what it looks like to configure this on Hover.com. If you are using other domain name registrar providers such as GoDaddy, etc. you would want to look at the guides on this page of the HubSpot Academy. This is on the “Going live instructions by registrar” guide on the HubSpot’s Academy Knowledge base. This should be referred to as “DNS”, “DNS Manager”, “DNS Settings” or similar. It’s role is really as a directory service for the internet. Whereby, the DNS server maps domain names to IP Addresses. That way you have user friendly names such as HubSpot.com and Google.com as the names you only need to type in to visit their websites. As this will redirect you to their IP Address (server address) so you can see the website. Saves us from having to reminder IP addresses such as 192.40.12.23, we just need to remember the name! 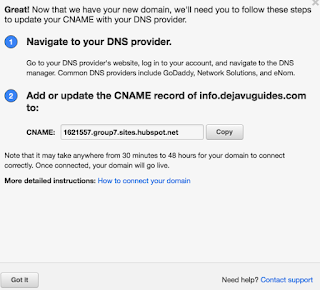 Add in the CNAME record to your DNS. Under hostname you would want to put the subdomain you defined. Record Type you would want to put CNAME. Target Host you would put the CNAME record. You should see a green light next to the subdomain you have created in your Domain Manager. Subdomain NOT configured. No green light. It will be up and running now, such that when you create a new website page or blog post, it will be associated with your configured subdomains.